Do you value any of these to offer advice, advocacy, or support to Life Leaders? These seven areas of focus in study and service are the core of what you can get from this web site as well as DrDavid.blog, where you get articles and see additional media content. Best-Self Leadership is part of the core mission to help individuals, groups, and communities learn and use principles and practices of living as our best-selves. That requires planning and action with coordination. When a student, I learned (outside of school) that successful people recommended, “common denominators of doing our best” should be taught at home, school, and places of work and worship. Life Leaders and I also provide resources and services to mentors of students, teachers, professionals, and others inspired to learn and serve as their best-selves. Learn more about Best-Self Leadership on Life Leaders’ web page. We focus on helping parents and educators help students write Plans for School & Life as well as learn age-appropriate leadership principles for leading their lives as a foundation for capacity to serve and lead others. Professionals can begin plans in school and advance in college and/or career so they start and grow better prepared for what organizations want, including graduates with a sense of calling plus capacity to work using plans, motivation, time management, and more to do their jobs more responsibly and effectively. 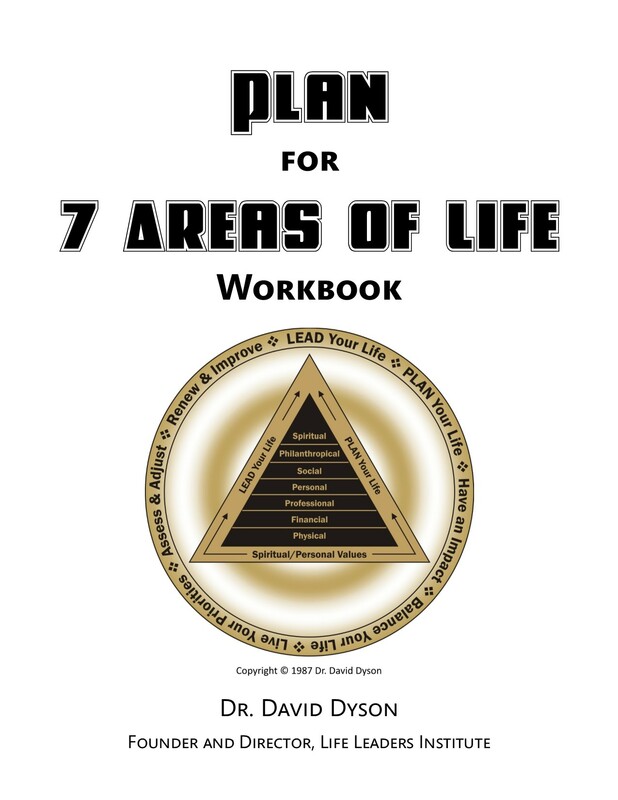 Workbooks aka Planbooks are available as handouts in seminars and workshops led by Dr. David Dyson or other faculty as well as for use in other programs for purchase or donation to Life Leaders. You may read and print online or order printed copies. People often find themselves facing seemingly unsurmountable challenges like “Goliaths.” David faced Goliath to save his people. We have worked with Veterans Making Comebacks from homelessness, moral injury, post traumatic stress, and addiction to create a plan better than the one that got them to despair. I remember the grandmother who wanted to stop smoking to had a chance to live to see her grandchildren graduate. She attended the New Year Resolutions Weekend Workshop where she found a way and the will to finally succeed. Others face obesity and the often associated low energy and diminished relationship often caused by unhealthy choices and habits. Challenges come at us, sometimes as ambushes and some we create ourselves. Some people set the same resolutions annually for years. Some have lost hope and quit trying. We can do better developing mindset and process to “Master” the “Goliaths” threatening our ability to do our best and care for others as we wish. Learn more at Life Leaders Page. Patriotism in Action by Dr. David Dyson and Col. “Stretch” Dunn provides printed materials for educators, students, veterans, and other patriots on how Veterans Day started in Alabama plus more patriotic guide content. On the cover of the book, President Reagan pins the Presidential Citizens Medal on Raymond Weeks of Alabama in 1982 honoring him at the White House on national television as the “driving force” for establishing America’s Veterans Day. The book serves as a patriotic guide for teachers, students, veterans, and other patriots, plus as a resource for the nation’s oldest Veterans Day. The book is donated to National Veterans Day to present to the National Veteran Award honoree and guest speakers from national organizations. Col. Bob and Nancy Barefield led events presented since the “911” attacks on America: Personal Leadership for Patriots and Tribute to the Founder (Driving Force) of Veterans Day, which opens National Veterans Day in Birmingham November 10-11. Birmingham, Alabama hosted the first national Veterans Day observance and has been a model for the nation. We share highlights about traditional and special events to tell more of the story and offer ideas to Veterans Day organizers throughout America [Excerpt from Patriotism in Action]. Posters are displayed in many schools, city halls, tourism centers, and veterans chapters by patriots reminding Veterans Day started here, it’s significance to students, and why we lead. Why we have Freedom to Flourish and how we can. The Case for Birmingham as Freedom City (in addition to “Magic City”) before hosting the World Games in 2021. Birmingham can be a Top 5 destination for National Veterans Day boosting national branding, tourism, and commerce. Freedom of Life and Liberty (National Veterans Day Movement). Freedom of Civil and Human Rights (National Civil Rights Movement). Together, they provide Freedom to Flourish. We can teach the history and meaning of freedoms as well as best practices to help students and adults write plans for school and life to act on Freedom to Flourish. Brand Alabama for Freedom (in addition to “Yellowhammer State”) through education and tourism. Alabama is the only state that led on both Veterans Day and Civil Rights Movements. Three major freedoms: Liberty, Rights, and Flourish (national movements for Veterans Day, Civil Rights, and Plans for School & Life) can grow forward. Brand Alabama for starting the national movement for America’s Veterans Day. Fewer than 1% know this national history though can through education and tourism. Top 5 resource for teachers of history of Veterans Day and character traits. Top 5 resource for teachers of Rights connected to Liberty by Veterans. Brand Alabama as a destination for Freedom, Rights, and Patriotic Holidays–meaningful marketing of events and tourism in addition to promoting food, beaches, getaways, and hospitality that are good though offered by other states. Resource for teachers of students to Plan for School & Life with Best-Self Leadership. People often treat other people and animals about the same when no one is looking so teaching higher levels of animal rights also helps human relationships. The Ranch is a good place for filming videos, such as this one where David prepared a message for a student organization. Follow Life Leaders Ranch on Facebook and our web page. William learning to grow, pick, and enjoy organically grown strawberries. Follow Life Leaders Farm on Facebook. Life Leaders America (nonprofit) also advances these areas of service to community and country through publications, events, programs, and Life Leaders blog.